Sight Words Printables for Learning Fun! Our sight words printables are a fun way to give your young learners more practice with Dolch and Fry sight words. 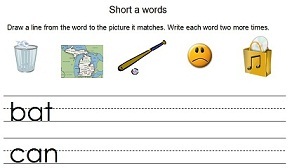 On these worksheets, students will write and spell these words. They will relate these words to real-life items: numbers, colors and foods. Follow the directions for each worksheet. Use the printable link to get the student's copy. Printable #1 - Clowning Around! the Dolch list include: red, blue, yellow, green, black, brown, and white. 2. Instruct your students to write one word in each of the numbered blanks at the bottom of their worksheets. 3. Finally, ask students to color the clown to match the color words they wrote in the blanks. 4. Print out additional copies for students who would like to color the clown again in a different manner. 1. Ask students to spell aloud the words for numbers 1 - 10 as you write them on the board. 2. On the worksheets, instruct students to write each number as many times as its name. For example, they should write the 1 one time, the 3 three times, and so on. 3. Then tell the students to spell the number word for each numeral two times in the columns on the right. Be sure to check out our collection of Fun Spelling Worksheets for grades 1 and 2. You'll find lots of all-new pages, not on the website, to help boost your first and second graders' spelling and phonics skills! String Things and Hidden Color Words- Two fun formats for spelling practice with common sight words. Bingo Sight Word Games - Printable game cards are ready-to-go! From our sister site, www.Word-Game-World.com. 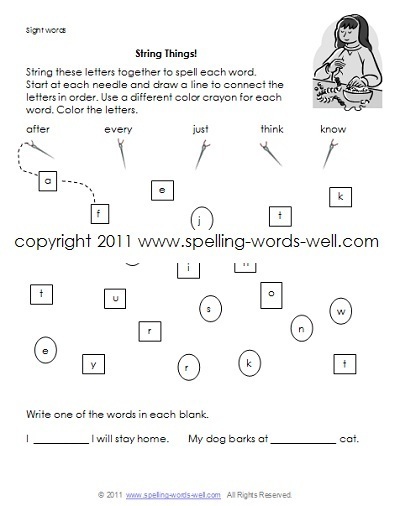 Number word practice - 3 printable worksheets to practice spelling and simple addition and subtraction facts. The fun twists I've added will make your kids want to finish each page correctly! Find a list of sight words and links to flash cards here. You'll find lots of lists of Dolch and Fry sight words, and flash cards for several grades. 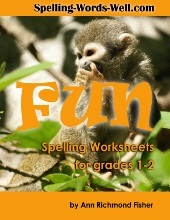 Word family worksheets - Worksheet and booklet templates so your students can practice spelling any word family anytime!